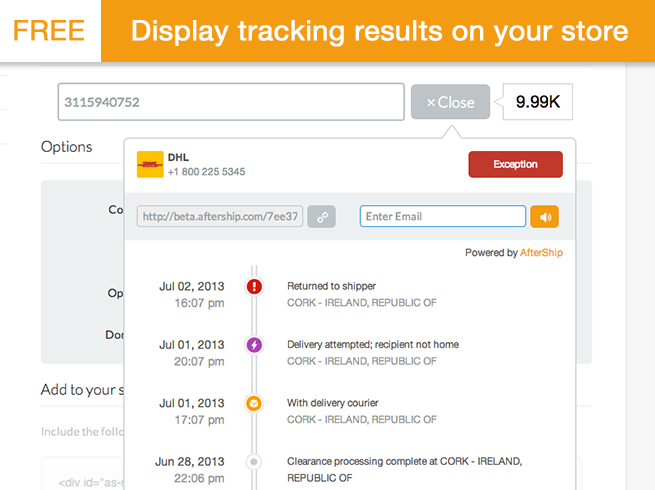 Track all shipments in one place, notify customers of delivery updates, and display tracking results at your store. 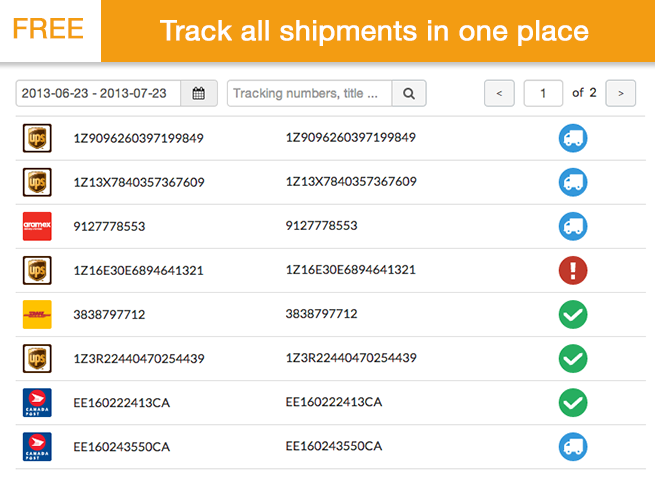 Track all shipments in one place, notify customers of delivery updates, and display tracking results at your store. Supports UPS, FedEx, DHL, USPS and 100+ carriers - See supported carrier list. 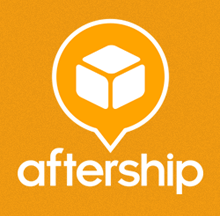 Shipments imported to your AfterShip account will be matched with the correct couriers and tracked automatically for free at AfterShip. You can easily filter and search by order id, customer name, email and tracking number. Each shipment will have a direct tracking link that you can easily share with customers. 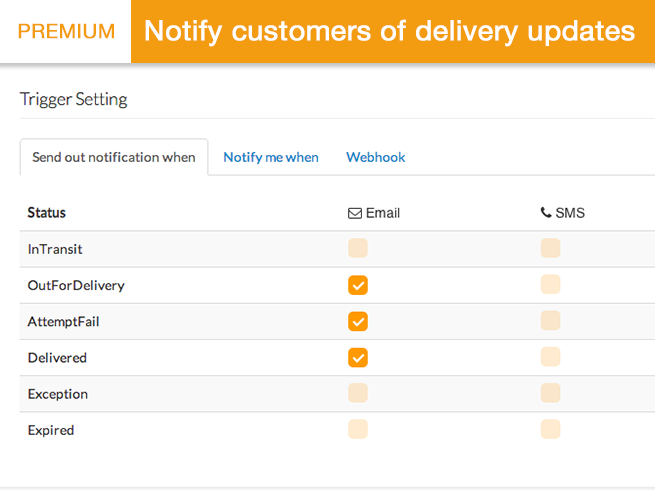 Upgrade to Premium to send out delivery notifications to customers or yourself. 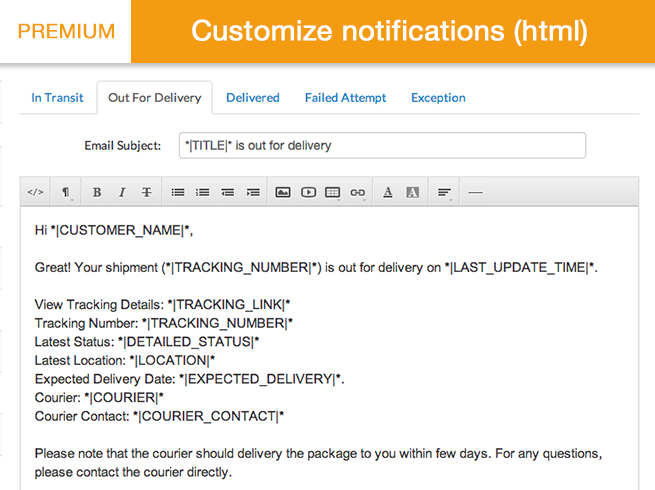 Your choice of notification triggers - In transit, Out for delivery, Delivered, Failed delivery attempt or Exceptions. 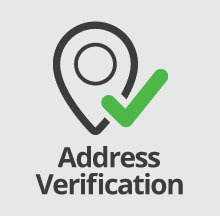 Use your own email to send out notifications, and customize messages to add store logo, URL, a direct tracking link to get more returned customers after shipping! Love how AfterShip track all my shipments automatically and let me know if the shipments are successfully delivered. Highly recommend! Very good tool for our online website. Highly recommended to others. Great app, never add a problem working with it, tracking details are always precise. This is a great app, definitely did not regret getting it. Setting up took a bit of tweaking but after that was done, everything was super! works about 30% of the time. orders do not auto import. We delete the connection and reconnect the REST API and things work for about 24 hours. We've contacted AS Customer Support several times and they respond the same way each time reiterating that their app works. We've provided a dump of all orders showing 70% of them had not been imported and they continue to say their app works with no additional information. Advanced Shipping Manager for 3D Cart is the only shipping solution for your online store. No other product offers more features or more control over shipping. This cost-cutting app will lower your shipping expenses from FedEx and UPS by 2-5%. Simply signup and watch the refund credits start rolling in.